I found this photo online, so no it was not one of my personal cup encounters. 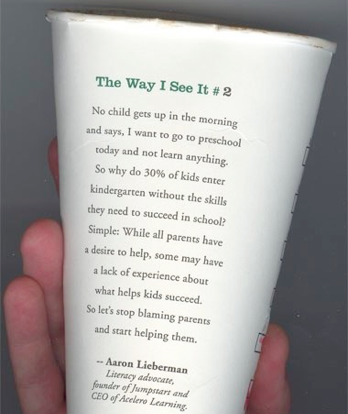 This is one of Starbucks’ coffee cups in their “The Way I See It” series. The idea behind the series is to promote healthy conversations. Well, their idea worked because it sure got me thinking and, in turn, talking. There are few things in my life that I don’t over analyze, so this thought process is quite typical! I think Aaron Lieberman was right when he said, “…let’s stop blaming the parents and start helping them.” I agree and I think his heart is in the right place. A lot of parents really have no clue and there do need to be good, legitimate resources out there. But then I read the article again, and again, and probably again. Something just wasn’t sitting with me right. There it was, “…why do 30% of kids enter kindergarten without the skills they need to succeed in school?” So why do they? Whose fault is that? Sure, people could say it is the parent’s fault, or maybe the preschool teacher’s fault, I agree that both might be lacking in the experiences they are giving our children. I say it is the school’s fault. Every year it seems like to enter kindergarten there are more and more requirements or skills that our children need to have. What ever happened to just showing up on the first day of school and the teacher worries about the rest? As teachers, have we become lazy and expect the parents, or preschool teachers to teach the children the things that used to be and should be kindergarten curriculum? Why have we taken away our children’s childhood to the point that we are pushing them through school? Why do we feel that our 3- and 4-year-olds need to be reading and writing? How inappropriate! Our school districts (and parents) need to re-evaluate what they view as age appropriate and quit pushing our children to succeed above what is appropriate for their age.